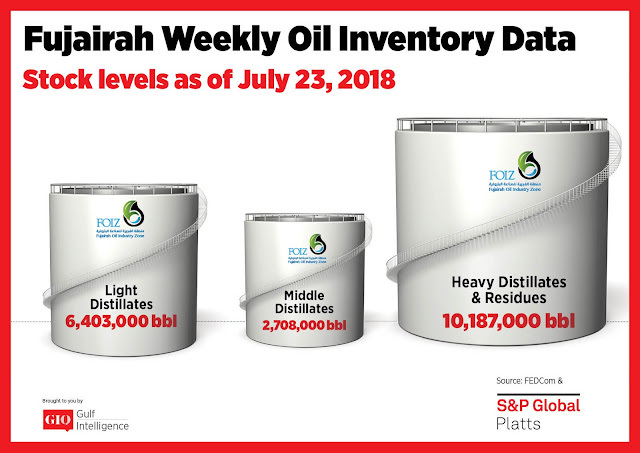 As of Monday, July 23 total oil product stocks in Fujairah stood at 19.298 million barrels. Total stocks fell by 4% week on week after hitting a seven-month high last week. Stocks of light distillates fell by 12.6% week on week to 6.403 million barrels. Fundamentals remained largely unchanged - weak in Asia amidst ample supply, but stronger in the Middle East. Bahrain bought an MR cargo of 92 RON gasoline slated to arrive in late August, a source aware of the matter said. In tenders, KPC was heard seeking three parcels of either 91 RON or 95 RON gasoline for delivery at Mina al-Ahmadi over August-October via a tender closing July 25 with same-day validity. KPC last sought three 25,000 mt parcels of gasoline for delivery over August-October in a tender that closed last week, but it was unclear if the tender was awarded. Spot premiums for Arab Gulf RON 95 gasoline were at $4.05/b yesterday. 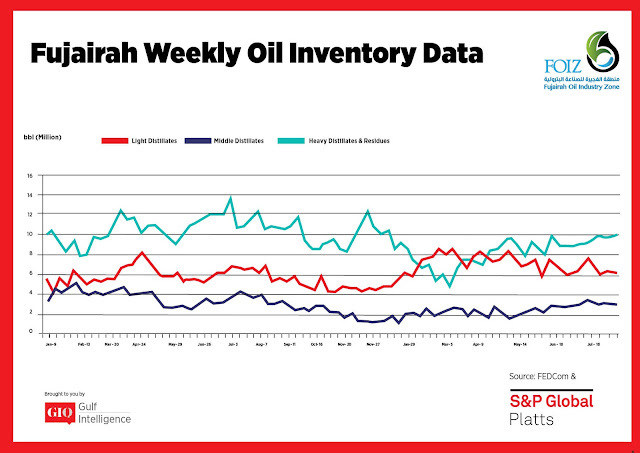 Stocks of middle distillates fell by 10% week on week to 2.708 million barrels – a six-week low. Traders said barrels were currently more likely to go east from the Arab Gulf rather than west into Europe. This is despite seasonally lower demand in parts of South Asia and Southeast Asia due to Monsoon rains. On-shore Singapore middle distillate rose for a seventh consecutive week to a 15-week high last week. The front-month East-West Exchange of Futures for Swap was priced at minus $6.08/mt yesterday – which is above the levels of minus $10-15/mt needed to make gasoil arbitrage workable. Stocks of heavy distillates and residues rose by 4.2 % week on week to 10.187 million barrels. Stocks rose to their highest level seen this year and topped 10 million barrels for the first time since December 25, 2017. 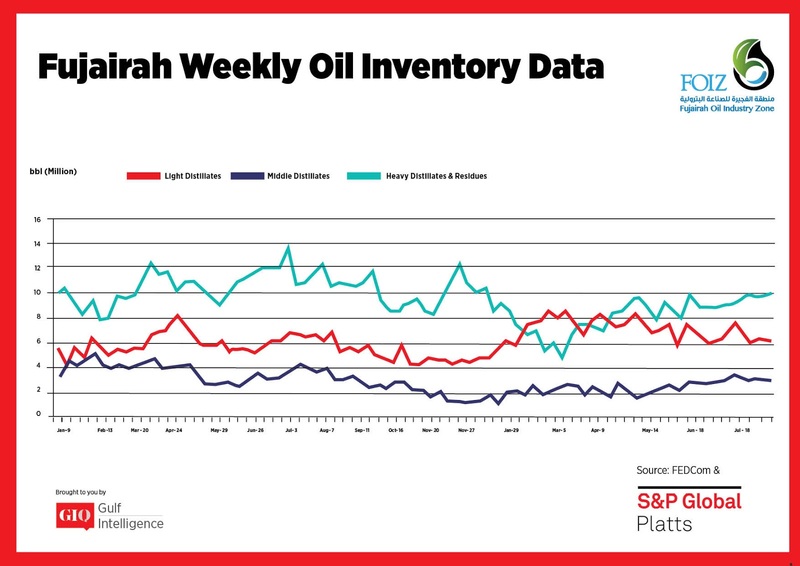 Inventory levels have risen despite the current backwardation in market structure, with the front-month time spreads for Arab Gulf 180 CST swaps at $7.25/mt yesterday on the back of the continued tightness in the Singapore market. "It is difficult to gauge the market as [fuel oil] time spreads and cargo premiums went crazy recently," a Singapore bunker fuel trader said.